Ross Barkley was decisive with two goals and an assist as England thrashed Montenegro 5-1 in Podgorica on Monday to make it two wins from as many games in Euro 2020 qualifying. Barkley – like full debutants Declan Rice and Callum Hudson-Odoi – was starting due to injuries, and he took full advantage of his opportunity, inspiring the rampant Three Lions by having a hand in three goals. Marko Vesovic's well-taken opener had England on the back foot early on, but they went into the break ahead thanks to Michael Keane's first international goal and an instinctive finish from Barkley, who set up the equaliser. 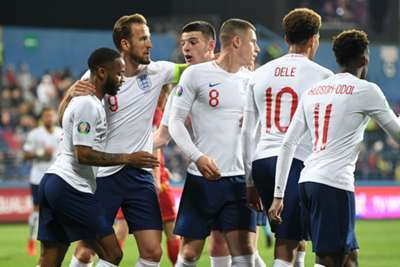 England's play became sloppy at times early in the second period but Barkley effectively ended Montenegro's chances just before the hour, while Harry Kane and Raheem Sterling wrapped up the victory to add to Friday's 5-0 demolition of the Czech Republic at Wembley. Although England controlled the early exchanges, Montenegro took the lead against the run of play in the 17th minute – Vesovic beating Jordan Pickford with a curling effort from 12 yards after playing the ball against Keane. The England centre-back levelled at the half-hour mark, however, finding the bottom-right corner with a fine header from Barkley's free-kick. Barkley was vital again as England took the lead eight minutes later, diverting Hudson-Odoi's slightly wayward shot in from close range. Danijel Petkovic was helpless in the 59th minute as Sterling's cutback was knocked straight to Barkley by Stefan Savic, and the Chelsea man swept home from the centre of the area. Kane got in on the act with 19 minutes to play, tapping a squared pass from Sterling - who was released by Barkley - in from close range for his 17th goal in 20 England appearances under Gareth Southgate. Manchester City star Sterling rounded things off in the 80th minute with a tidy finish following substitute Jordan Henderson's incisive pass. Although England's performance against the Czech Republic was impressive, they were not exactly required to show much mental fortitude. The same cannot be said about their trip to Podgorica, as they fell behind early on to a team more than prepared to scrap. It was not vintage, but they showed a strength of character and ruthlessness rarely associated with England teams over the past two decades. While Barkley was the star of the show, Hudson-Odoi deserves praise. Many spoke of misgivings about his senior call-up given he is yet to even start a Premier League game for Chelsea, but – after a shaky beginning – the 18-year-old winger more than showed his class. Montenegro's captain and most-recognisable player, Savic endured a less than impressive outing. He failed to cut out Sterling's pass for Barkley's second goal and then let Kane run through for his solitary strike. 2 – Ross Barkley has scored as many goals tonight as he had done in his previous 26 games for England (2). Buses. - England have won five consecutive matches for the first time under Southgate. It's the first time they have won five in a row since October 2015 under Roy Hodgson. - England have scored five or more goals in consecutive matches for the first time since November 1984. - Sterling has had a hand in seven goals in his last four England games (six goals, one assist), as many as in his previous 31 appearances. - Barkley's first strike was the first England goal scored and assisted by Chelsea players since September 2007 - Shaun Wright-Phillips converting and Joe Cole assisting. - Hudson-Odoi (18 years, 138 days) became the second youngest male player to start a competitive match for England after Wayne Rooney versus Turkey in April 2003 (17 years, 160 days). While Montenegro return to qualifying action in just under three months with games against Kosovo and the Czech Republic, England's next outing is their Nations League semi-final with Netherlands in June.